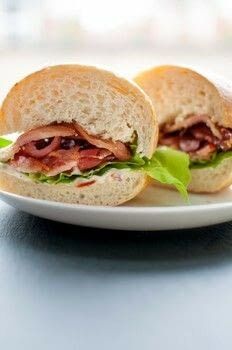 Kick your BLT up a notch! 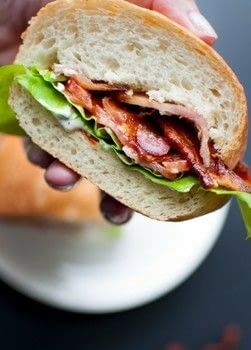 A BLT with thick-cut bacon and an easy to make sun-dried tomato and garlic mayo. Fry the bacon on medium heat until crispy, flipping occasionally. You can prep the other steps while the bacon is cooking. Chop sun-dried tomatoes into small pieces. Crush or mince a clove of garlic. Add to mayo. Set aside. Slice tomatoes and tear lettuce into desired size for sandwiches. Spread mayo on rolls. Add lettuce and then tomato and top with bacon once it's cooked. Add salt and pepper if desired.